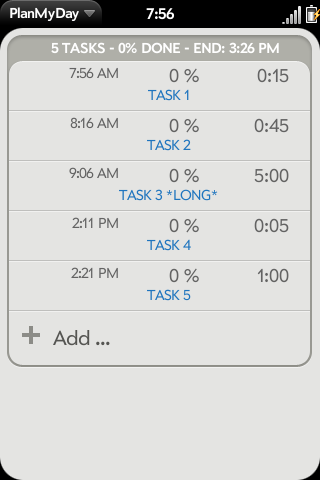 PlanMyDay PlanMyDay is a Tool, that helps you planning your days work. After assigning a duration and the ordering of entries, the user gets an overview what must and can be done today. During work on every single event, the times they take get recalculated and the progress can be updated. Then it is always possible to see if everything is in plan or hurry is needed. Why did I wrote it? On some days it happens, that the things I have to do consumes more time than the remaining hours of the day. Then always some questions come up: How much time do the different appointments take? What are the most important thing to do? How many appointments can I finish in the remaining time? PlanMyDay gives the answer!